Something that really annoys me is when a biography writer keeps having to tell you how and when he spoke to the subject, or who he spoke to on the phone on transatlantic calls. His happens at the beginning of the book and during the first three chapters as I was rapidly losing interest in what he had to say about this movie legend. I was reminded time and again how author Michael Munn "knew" John Wayne and all the people he met or called. Ho hum. I had to stop reading as I found it so egotistical - "look who I spoke to, look who I met" - I nearly puked. It's distracting and unnecessary. 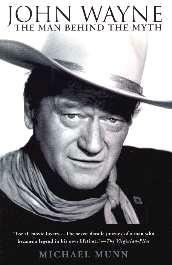 He writes about how John Wayne changed his name, the movies he starred in, how he got into showbiz, his right-wing politics, a plot to assassinate him, his failed marriages, his drinking, and his battle with cancer. Having made over two hundred movies, his career was enormous but it wasn't always successful. Early in his career he battled along with Fox and Columbia studios before moving on to better things at Warner Bros. I admit defeat - I couldn't stomach anymore of this book. I'll look for another biography to review.